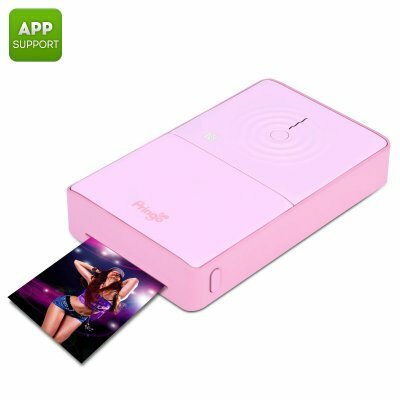 Successfully Added Pringo P232 Portable Photo Printer - 2.1 x 3.4 Inch Photos, Wi-Fi, Free Android + iOS Apps, 290DPI, 2600mAh Battery to your Shopping Cart. You probably have uploaded all your favorite pictures on Social Media, however, nothing goes above sharing memories with your loved ones through a physical memory such as a printed photograph. Pringo’s new portable phone printer allows you to print your favorite digital pictures directly from your smart phone. By combining modern technology with the nostalgic feeling of using a Polaroid camera this portable smartphone printer is a perfect accessory for young and old. Its compact size and light weight allows you to carry around the accessory anywhere you go, ensuring you that you can always print those perfect moments you would like to share with friends and family or simply hold onto for yourself. Pringo’s portable photo printer uses dye sublimation technology and offers you the possibility to print your favorite pictures in 290dpi resolution under just one minute. Unlike those old Polaroid cameras you now don’t have to print every picture that you take. When using the free to download Pringo App you can select those pictures you like most, ensuring that only your most favorable digital pictures will be turned into an amazing physical memory. Its improved built-in 2600mA battery allows you to print up to 50 images per charge, allowing you to print plenty of memorably moments. Its Wi-Fi connectivity furthermore offers you the possibility to link the device quick and effortless to your iOS or Android Smartphone without the use of any further cables. This smartphone photo printer is the perfect accessory to turn your digital pictures into printed and physical memories. Whether you use it on holiday, during a fun night out with your friends, or simply at home, this accessory is perfect for those who like to capture and share the amazing and most memorable moments in life. This Portable Wi-Fi Printer for Smartphones comes with a 12 months warranty, brought to you by the leader in electronic devices as well as wholesale cool gadgets and Smartphone accessories..